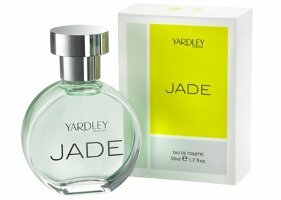 In March, Yardley London will launch two new fragrances, Jade for women and Chrome for men. Two existing fragrances have been renamed: Royal English Daisy will be Yardley London Daisy, and Royal Diamond will be Yardley London Diamond. Jade for women ~ a green floral chypre developed by perfumer Anne-Sophie Chapuis. The notes include peach, bergamot, galbanum, rose, jasmine, ylang ylang, orris, patchouli, sandalwood and moss. Chrome for men ~ a green fougère developed by perfumer Christian Provenzano. Notes include fresh water accord, galbanum, apple, bergamot, lavender, coriander, rose, moss, musk and amber. Yardley London Jade and Chrome will be available in 50 ml Eau de Toilette. I’m surprised by the name Chrome, because Azzarro already has one of those, and as far as I can tell nobody’s used it before or since; it’s not like calling your scent Gold or Silver or Black or something equally generic. I would think that Chrome is linked to Azzarro in the same way that the number 5 is linked to Chanel. Or am I completely wrong? I don’t know anything about trademark law. Not every brand registers perfume names as trademarks, and sometimes they can’t because the name is already in use. So no idea if Azzaro has trademarked Chrome. But yes, it’s widely known…I wouldn’t say so much as No. 5, but still.